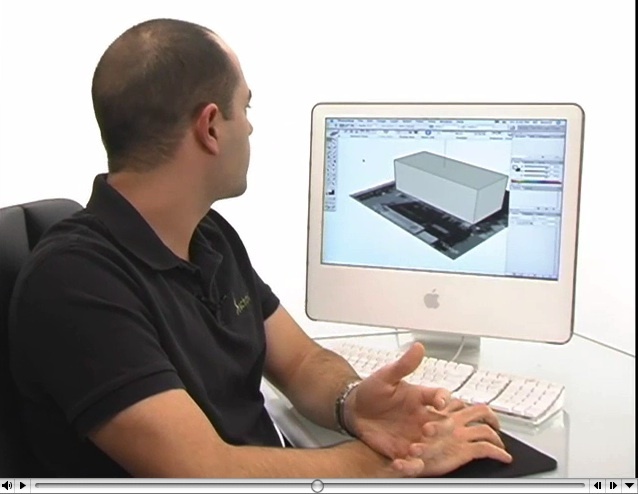 Two certified SketchUp instructors called Mike Tadros and Alex Oliver have created a number of excellent video tutorials (podcasts) at a web site called go-2-school.com. These videos (Quicktime required) are professional-grade with nice transitions, music, and excellent zooms to show details on user interface sequences. They have chosen broadcast quality resolution (so you can see all the details), which does mean you either need very good broadband or need to be patient during download. Here are some Google Earth relevant tutorials: Google Earth to SketchUp - Part 1, and SketchUp to Google Earth - Part 2. If you are looking to learn more about using SketchUp, these video tutorials are worth watching. Also available from the "School" guys is a video interview with Google's John Bacus at MacWorld earlier this month where he shows the new 3D buildings in Google Earth 4. Related: See some of SketchUp's own video tutorials. One of the more basic outputs of GIS applications is a file type called a shapefile. A shapefile is a geospatial vector data format developed and popularized by GIS software maker ESRI, but used by other GIS software makers as well. For example, it's possible to use free GIS applications like MapWindow to produce shapefiles. There's an inexpensive ($29.99) application called Shape2Earth (Windows only) available which will let you convert shapefiles into KML so you can view your GIS data in Google Earth. 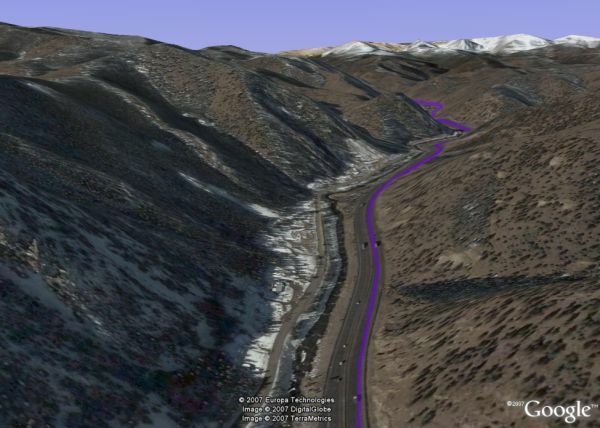 For more sophisticated GIS to Google Earth conversions, there are two other tools to consider. Arc2Earth ($99 - $299) is probably the most sophisticated (mentioned at GEB last year) which provides many tools for converting data and visualizations from ESRI's ArcGIS software. Arc2Earth has been updated substantially since it was first released. Also available is an application called KMLer ($20 - $50) which also has support for ArcGIS (see last year's GEB write-up). 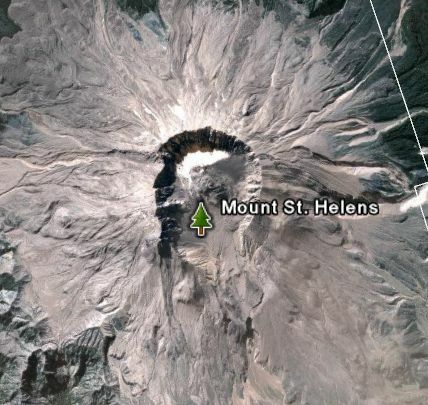 About a year ago, someone at the Google Earth Community called 'satishgsk' did some work collecting placemarks of interesting examples of extremes all over the Earth . Examples: 'deepest canyon', 'tallest bridge', 'shortest river', 'largest crater', etc. His post includes lots of photos, but it's better to just look at the placemarks and see the place in Google Earth. The placemark descriptions include photos and a brief description. Note that the "facts" presented are not exactly documented, so the accuracy of the statements may be in question. But, it's a fun collection to load and do some sightseeing. As previously mentioned (in my article last week about the University of Colorado/Boulder in 3D blog entry) Google is holding a contest for the best 3D model of a college campus created with SketchUp and posted for viewing in Google Earth. Google has just announced the contest on the Official Google Blog, and there are more details than when I first discovered the contest. Entries need to be submitted before 1-June-2007. The contest will be judged by a panel of experts from places like Disney, Electronic Arts, and even architects. See the contest web page for details and registration instructions. Follow the link to my earlier story to see a video showing the Boulder campus already completed by some Googlers at SketchUp, or you can just go to Boulder with GE 4 and turn on the "Buildings -> Best of Google Warehouse" layer to see it in full detail. By the way, some of the teams with the best entries will win a 3-day trip to the Googleplex for a work shop on 3D modeling. 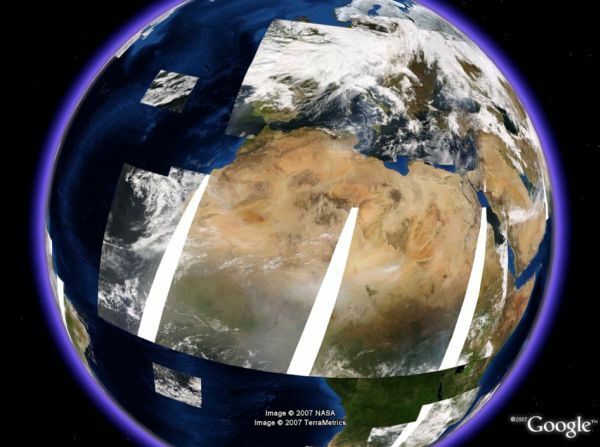 Third Life - Google Earth's Next Step? 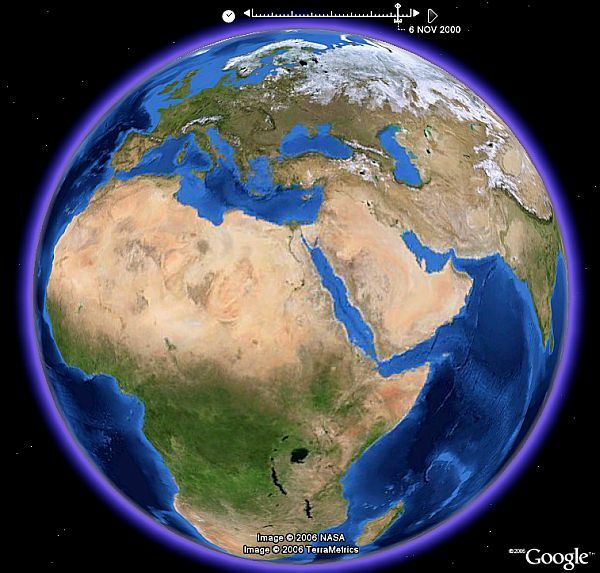 TechCrunch has just published about some rumors that Google is working on using Google Earth-related technology to create an application similar to Second Life or There. These ventures are some of the more successful attempts to build an alternative 3D "universe" (called a Metaverse) where you can interact with other people through the net by building avatars who represent your self in that other world. The concept of the metaverse was popularized by a science fiction book called "Snow Crash" by Neal Stepheson (a good read by the way). In fact, according to John Hanke - Director of Google Earth - scenes from that book were part of the inspiration which led to Google Earth. TechCrunch points to a blog entry by one of the investors of Second Life that they believe "Google is working on turning Google Earth into a virtual world a la SecondLife." TechCrunch also pointed to a Business 2.0 article last month (not sure how I missed this one) which discusses in more detail speculation that Google may move in the direction of creating a metaverse. That article correctly points out that between Google Earth and SketchUp, Google has a lot of the right technology to make this possible. One blogger has speculated Google would just buy Second Life. There is certainly a lot of merit to the speculation Google might create a metaverse. In the 1980s, I worked on virtual reality technologies at NASA, and I've been a big fan of Snow Crash and the concept of a metaverse since the book was first published. There have been many attempts (I made a couple attempts myself) since the early 90s to make metaverses - and the concept is finally starting to catch on (mostly because the standard desktop can finally handle the 3D graphics required). Google Earth has already demonstrated many innovative ways to pull in diverse dynamic information from the Internet and share that in a visually appealing way. And Google has barely tapped the possibilities even with GE 4 which just came out. 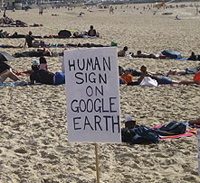 There are many possibilities for improving Google Earth and how we interact with it. But, Google Earth is not a metaverse. It's a virtual globe on steroids. However, thanks in part to GE and SketchUp, Google has the right technologies, and experience with data scalability and interfaces to make a metaverse work. For Google there could be big money (even more advertising possibilities) by providing better ways to interact with Internet information rather than just using a standard browser. Buying SecondLife? There could be some merit to that strategy, but Google could certainly develop their own platform if they chose to go this route - and marketing would not be a problem. 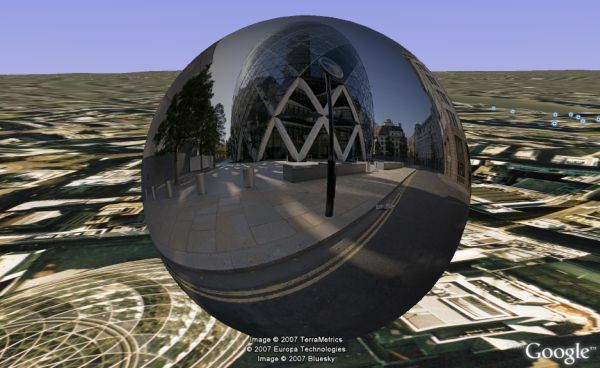 I'm eagerly awaiting further developments for both Google Earth/virtual globes, and what happens in the rapidly developing Metaverse market. We live in exciting times! This is a truly inspiring demonstration. It quickly captivates the mind about the opportunities, but if you watch closely you realize Jeff has truly come up with some innovative human-computer interaction concepts. via OgleEarth who, like me, can't wait to try this out! Related: Another touch/gesture/speech interface from a year ago using Google Earth and demonstrated by Edward Tse. Google Earth tiene la capacidad de guardar o imprimir la vista actual de GE. La versión gratuita de GE sólo puede guardar una imagen de hasta 1000x1000 pixels (o de tu tamaño de pantalla), pero la versión GE Pro puede hacerlo con imágenes de hasta 4800x4800 pixels, que es más que suficiente para impresiones de calidad de gran tamaño. Estuve experimentando esta capacidad en GE 4 Pro, y los resultados son asombrosos. Por ejemplo, tomé este panorama como captura de pantalla de edificios 3D de Denver, Colorado (vean el artículo en el blog que escribí sobre estos modelos). Que lo pueden ver haciendo clic en la imagen de arriba a través de un Album Web de Picasa. Una vez allí, seleccionen "Descargar foto" para verla a plena resolución (4800x1199 pixels). La calidad de estos modelos 3D foto texturados cuando uno acerca la vista a fondo es increíble. El método que utiliza GE Pro para crear estas imágenes es fantástico. Eligen del menú "Archivo->Imprimir..." o "Archivo->Guardar ->Guardar Imagen..." para iniciar el proceso, luego eligen qué resolución desean tener. Con la opción "Guardar" deberán especificar el formato de la imagen (jpg). GE Pro básicamente utiliza el mismo método que algunos fotógrafos para crear fotos con cámaras digitales en "gigapixels" tomando una serie de fotos en serie, una al lado de otra y utilizando luego un algoritmo de empalme. Cada "toma" es "expuesta" lo suficiente como para que se graben todos los detalles de la escena. Es divertido ver - las primeras veces. Me dí cuenta de que no se puede uno acercar demasiado a la escena cuando hay edificios 3D porque el empalme automático hará que se pierdan algunas partes de los modelos 3D en cada toma. Tomen nota de que deberían leer las licencias tanto de GE, como de GE Pro (busquen "licencia" en la página de ayuda de GE) para lo que tenga que ver con la impresión ya que dice que pueden ser utilizadas "sólo para uso personal". Tampoco pueden tener permiso para vender las impresiones - le pregunté a Google sobre esto.. This is pretty interesting. I read about this at Ionut Alex. Chitu's blog. In honor of the celebration of the national holiday Australia Day 2007 on January 26, Google has announced it will be taking new aerial photos of Sydney. 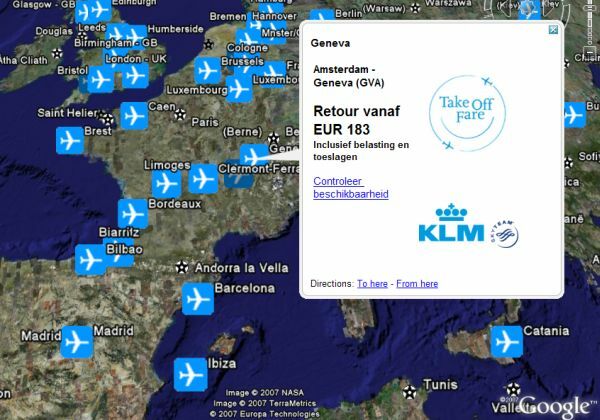 The announcement includes a Google Maps mashup where you can drag a placemark around to find out approximately what time the plane is expected to fly over. 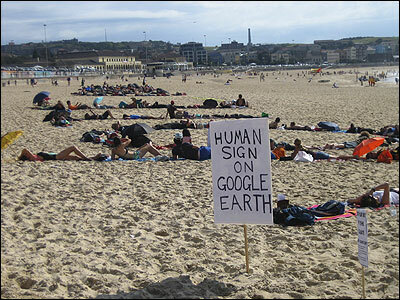 Google also added a custom URL/sub-domain for Australia last week at maps.google.com.au. See the Sydney Morning Herald story about this which has more details about the aerial photo shoot. This is a bit of a risky move from a PR perspective. Quality aerial photography is dependent on perfect weather conditions. If its a cloudy day - the day will be a disappointment. Other things can go wrong as well such as airplane maintenance issues, photography equipment failures, air traffic control issues, and imagery processing problems (most aerial photographers still use traditional film systems). But, if its a beautiful day, and all goes well, in a couple of months from now we could see some really interesting photos in Google Maps/Earth where people actually had a chance to know about an aerial photo shoot. I wonder if we'll see some interesting banner ads laid out on roofs? Over a year ago, some folks at web design company Glooton in France released a cool network link that let you track cruise ships around the world from Costa Cruise Ships. Clicking on the placemarks for the ship location also shows you updated web cam photos from the ships. 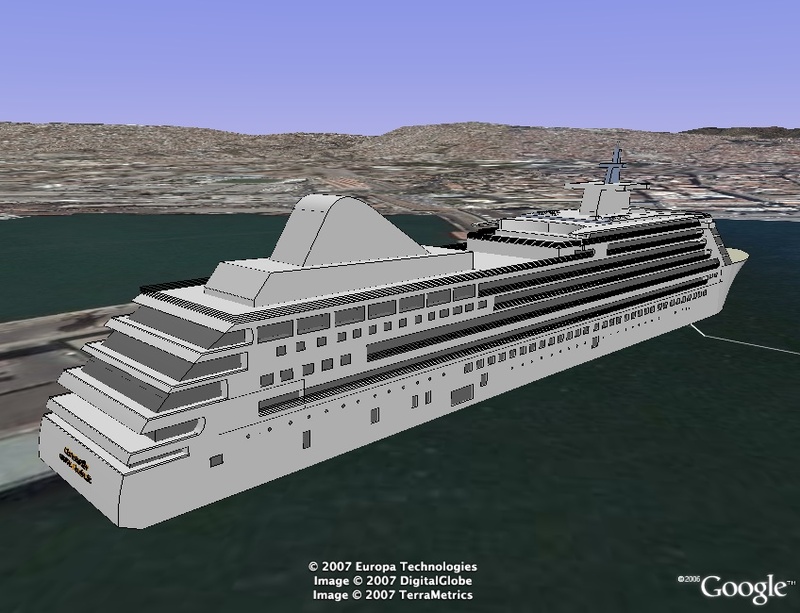 A couple of weeks ago, a Google Earth Community member called 'svens' posted a new version of the cruise ship tracking network link which includes 3D models to show the position of the ships, and new network links to let you track the ships as they move. 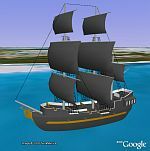 He's also recently added 3D name labels on the backs of the ships (using the new 3D text capability with SketchUp 6). See the instructions in the "Cruises" folder under the network link in your "Temporary Places". And, if you click on the folder for each cruise ship you can see the web cam photos and other information (like weather, speed, position, heading, etc.). These 3D models are a little complex - so they look good. But, they also might slow down your Google Earth viewing (due to memory and graphics complexity). So, turn them off when you are done looking - you can selectively turn off the 3D models and still view the other data. KML 2.1 Docs - Google has substantially updated the KML documentation. This includes new KML samples, KML tutorials, and KML reference docs. New Blue Marble - Someone at NASA has put out a GE 4 network link allowing you to view the Blue Marble Next Generation from a WMS (Web Mapping Service). This means you get pretty smooth updates of higher resolution versions as you get closer. It also time stamps the data and lets you view all 12 versions for each month of the year. You can animate the results as in my Blue Marble Time Animation. One thing I don't like is that the NASA BM images are dark and need a color saturation boost. But, I'm glad to see this regardless. Posted at the GEC by 'OnEarthWMS'. More Panoramas - The new innovative approach for viewing panorama photos from DigitalUrban has resulted in several new examples. It involves placing the photos inside a 3D sphere - which you can read about here. Here are some stories highlighting new samples: Trafalgar Square, Snowdon in Wales, Andy Warhol, and someone has done kite aerial photos with it as well. It probably will not surprise many of you that if you go to Google Earth 4 now with the new "Best of 3DWarehouse" building layer turned on that Google has modeled much of Boulder with photo-textured 3D buildings. After all, Boulder is where @Last Software, makers of SketchUp - and now part of Google, was founded and is still operating. SketchUp is a free 3D modeling software package that allows you to build and upload your own 3D models into Google Earth. I've created a YouTube video of the buildings in Boulder and you will see they have modeled the entire University of Colorado at Boulder campus. I also noticed the Google/SketchUp office building is not rendered, but the SketchUp guys posted some models of Boulder last year so I show it in the video. The top 5-7 teams (max 50 people) will win a 3 day trip to Google's Mountain View headquarters to participate in a workshop with 3D modeling experts from Google, get free airfare and hotel, food in our world-famous cafes, and a guided tour of our incredible campus. Oh yeah, and lasting online glory! 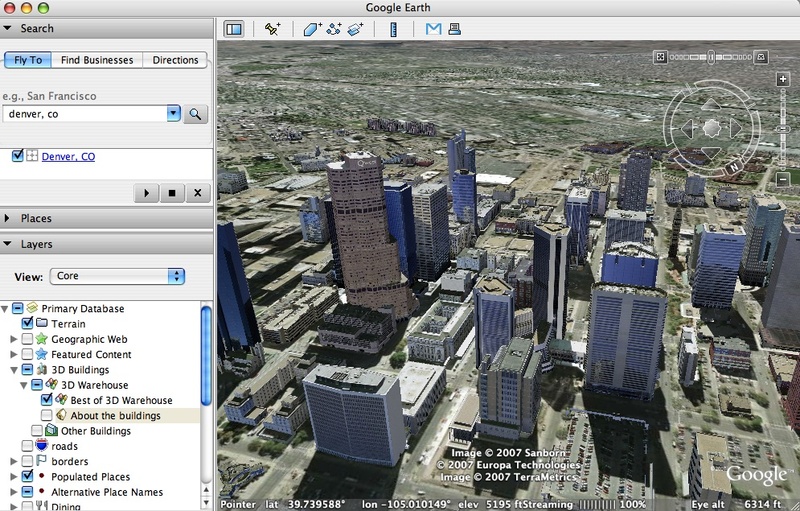 The 3DWarehouse now has a new mini-video tutorial showing how to use the 3DWarehouse network link in Google Earth. The network link is a great way to find thousands of other 3D models posted for viewing in GE. Spiegel Online de Alemania ha publicado una nota (en alemán) [Aquí hay un resumen en inglés.] sobre una colección impresionante de edificios 3D foto texturados para Google Earth. De acuerdo al artículo será publicado por Google pronto, pero los modelos no fueron creados por Google. Aparentemente, los modelos fueron provistos por el "sector privado de la ciudad". Spiegel Online lanzó una serie de capturas de pantallas y un video (Flash requerido) que muestra estos modelos de edificios - y la verdad es que se ven muy lindos. Por suerte, la colección será publicada en la capa de Edificios 3D pronto (el artículo dice que en pocos días o semanas). Les haré saber en cuanto esté publicada. Gracias a los lectores alemanes del GEB Volker Kinkelin y Boris Friedrichs por el dato. Este artículo describe algunos consejos sobre cómo acomodar tus opciones en Google Earth 4 ("Preferencias" en la Mac). Si todavía usas la versión de GE 3 este viejo artículo del blog te ayudará, pero recomiendo que instales la versión 4 de GE. Si haces clic en la "categoría Consejos Google Earth" de este blog, encontrarás otros consejos y sugerencias para mejorar la experiencia con GE. O fíjense en los "Principios" para tener una lista de historias que cubren el uso básico de GE. Para ir a las Opciones vayan a "Herramientas -> Opciones" (o "Google Earth -> Preferencias" en la Mac). Esto habre una ventana con las siguientes pestañas: Vista 3D, Cache, Viajes, Navegación, General. Ajusten el Area Detallada->Grande si tienen una placa gráfica decente, y pongan la resolución de pantalla alta, esto mejorará los detalles visuales. Es lo mejor si quieren hacer capturas de pantallas. Ajusten las fuentes para hacerlas legibles sin que lleguen a ser distractivas cuando estén viendo algún lugar. Si usan GE para ver montañas, prueben la Exageración de la Elevación en 1.5 o más. Esto hace que el terreno 3D se exagere un poco. Poniendo 2.0 se exageraría al doble. NOTA: la capa "Terreno" debe estar activada para ver el terreno en 3D. También es bueno volver la Exageración a 1 si están subiendo un modelo 3D para que quede a la altura ideal. Para más consejos sobre la perfomance:vean esta entrada del blog. GE 4 optimiza este seteo automáticamente. Lo pueden ajustar, pero recomiendo dejarlo como está a menos que cambien la cantidad de memoria de sus sitemas. Si les sobra espacio de disco, seteen la cache de disco a 2000 MB (2GB) - el máximo que pueden usar - esto significará menos descarga de imágenes cuando están por lugares ya vistos. También pueden usar a GE sin conexión de una manera mejor. Ajusten el control de Velocidad de Vuelo / Viaje para tener más velocidad , sobre todo si usan mucho a GE. Esto se traduce en vuelos más rápidos cuando hacen doble clic para ir de un lugar a otro. Las Opciones de Viajes sobre cómo llegar les permiten acomodar la inclinación de la cámara, velocidad y alcance. Configuración de la Rueda del Ratón - Les recomiendo ajustar la velocidad de la rueda del ratón porque así acelerarán los movimientos de acercamiento y alejamiento en GE. También pueden invertir el orden de la dirección de la ruedita para acercar o alejar. Marquen "Mostrar resultados web en un navegador externo" si quieren (o no quieren) usar un browser externo cuando hagan clic en algún vínculo de la descripción de una marca de posición. Ahora, vayan y disfruten de la experiencia con Google Earth 4! 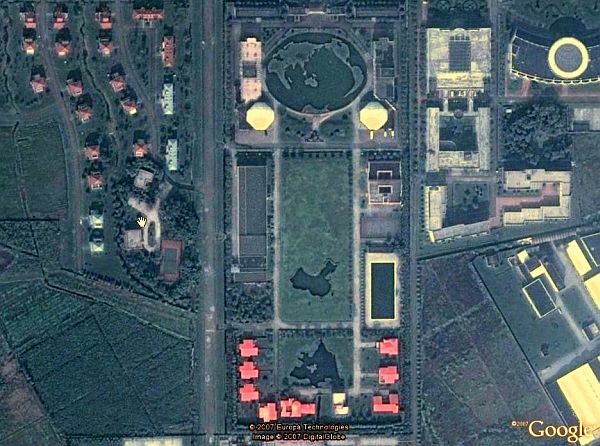 Someone at the Google Earth Community called 'maiky1974' posted a placemark showing a garden in China which has a map of the world when viewed from above. Just to the south there are ponds in the shape of China and another in the shape of the province (see comments in the GEC post). The satellite photo of the area has a bluish tinge to it (probably due to haze and lack of color enhancement). If you click on my thumbnail here you will see a larger photo of the area. I color enhanced the photo using Picasa. Thanks to Joe for the tip! It seems everyone wants to start off the new year with new Google Earth stuff. Which is great! I've had a virtual flood of people wanting me to write about their new interesting GE content. I really appreciate the input, but I'm starting to fall behind in reporting all of them. This week, you regular GEB readers probably noticed about double the normal number of posts at GEB. This roundup is an attempt to start catching up with more. KML indexing - Google Maps API blog posted a tip for web/blog owners on how to get KML files indexed by Google so people can search and find your interesting GE files. 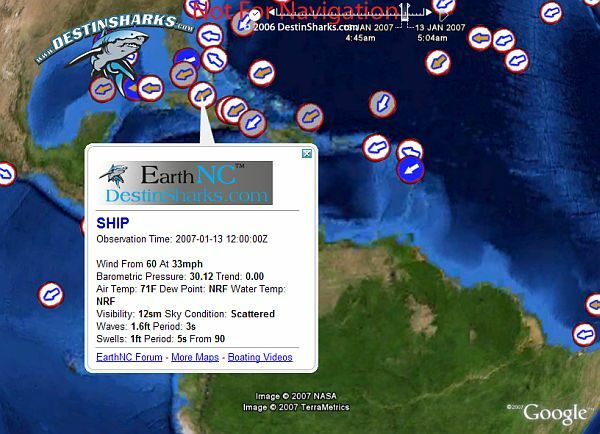 GPS tools - DestinSharks.com has posted an excellent write-up on using GE with a GPS to show real-time position. He talks about several applications you can use. This is a nice complement to my blog entry on the same topic. SketchUp PhotoMatch - SketchUp 6 was released this week, and one of the biggest new features is Photo Match. Photo Match lets you create 3D models from photos. This is particularly useful for creating photo-textured 3D buildings for GE. There are a few video tutorials available on the new features. Watch this double-speed 5 minute video to see a building created by a SketchUp staffer with Photo Match in only 10 minutes. GE blogs - there are new blogs with a focus on Google Earth cropping up in other parts of the world. Check out SinGeo.sg, a blog with a focus on Google Earth content for Singapore. Also, in Denmark there's Boliga.dk (which is clearly about GE, but I don't read/speak the language). It's a real estate site which uses GE, thanks Bent! Those of you who are regular readers of Google Earth Blog (GEB) know that I have been campaigning Google to create a better view of Earth from space. I really don't like Google Earth's default ugly-looking view of the Earth from space. Google could easily offer an option in the layers to allow a prettier view of the Earth to those of us who would prefer it. So, a few weeks ago I published an add-on called the Blue Marble (for GE 4) which is based on the beautiful NASA Blue Marble Next Generationa data - except, I brightened the NASA photo and increased its color saturation. My add-on lets you view the Blue Marble from space (it shows a view based on the current month), and when you get closer it will fade out letting you see the normal GE imagery. Ideally, higher-resolution versions of the Blue Marble would transition as you get closer, but I haven't had the time to set up and process the imagery and KML. Anyway, I just found out this week that Yahoo Maps now has an awesome high-quality aerial view of Earth, and they also use the Blue Marble NG. They transition to higher resolution data as you get closer and have a very high quality, carefully color balanced, dataset using another imagery set (I believe it is Landsat) when you zoom even closer. The work was done by i-cubed. Kudo's to i-cubed for a great job! By the way, NASA's free WorldWind virtual globe also uses Blue Marble data and looks better as a result. I highly recommend checking out FlashEarth.com to compare the aerial photography of the top mapping tools out there (currently it allows you to compare: Google Maps, Microsoft Virtual Earth, Yahoo Maps, Ask.com, OpenLayers, and NASA Terra). FlashEarth has a very smooth interface allowing you to use your mousewheel to zoom, and it also allows you to rotate the view by using the compass in the upper right (a feature most of the mapping tools don't provide themselves for their data). Using FlashEarth, I think you will quickly agree that Yahoo Maps now has the best looking views of the Earth from space (from higher altitudes) verses all the other major players (Microsoft, Google, and Ask). And, unfortunately, Google Maps has the worst high altitude view IMHO. Of course, zoomed in close on a comparative basis world-wide, Google Maps/Earth will win 9 times out of 10 over any of the other players. Anyway, whoever has done FlashEarth - Great work! 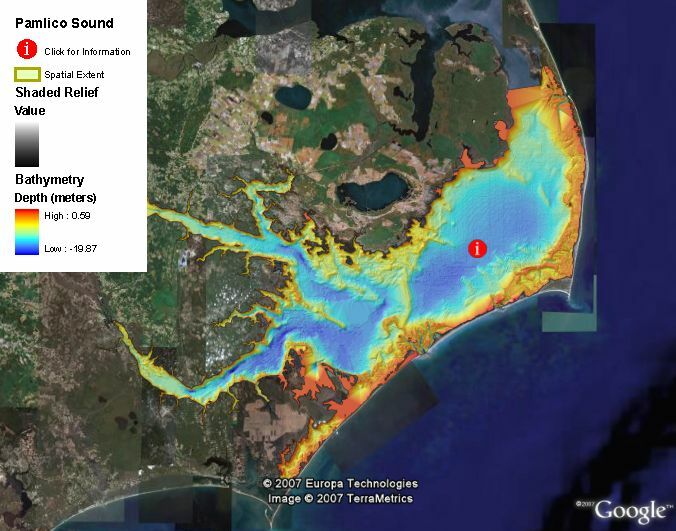 I was contacted recently by NOAA regarding their release of bathymetry data for estuaries around the US. These colorful datasets "...are an interpolated data set representing the most up-to-date depth sounding information that was available at the time of publication (1998)." Read more about the data. You can view the page providing access to the GE files here, where you select a region and then select which estuary you want to view. 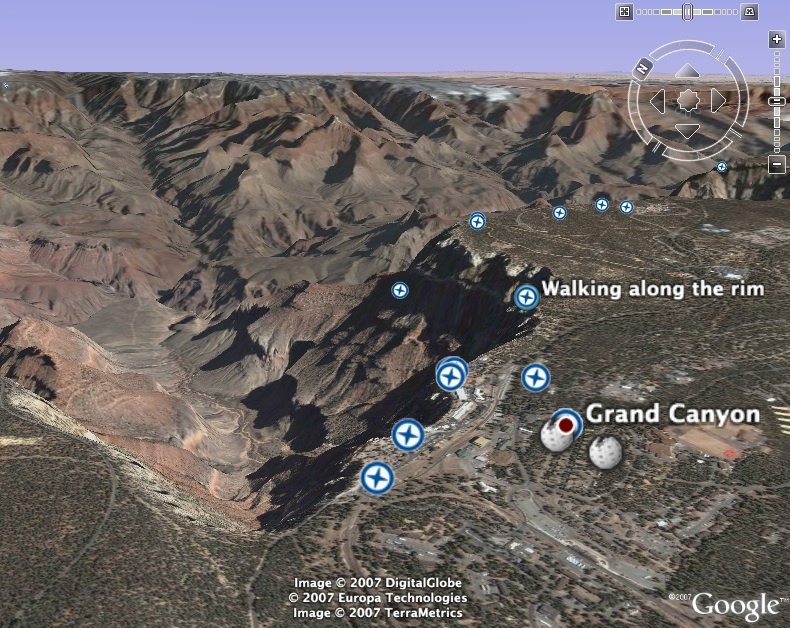 Then look for a link to "Google Earth Visualization files". Here's a sample of the Pamlico Sound in North Carolina. Thanks NOAA! A GEB reader wrote me to tell me of his project over the holidays to create a dynamic KML which shows Shuttle Radar Topography Mission (SRTM) digital elevation model in a shaded relief format for North America (NOTE: GE 4 is required). Jiro implemented this using KML 2.1 region tags so you get more detail as you zoom in, and it works very quickly. He also has used Google Picasa web servers and managed to parse the resulting location of all the images which really helps since the images end up being on many servers. The entire database is just under 1 GBtyes. But, you don't need the technical stuff. Just go download this shaded relief map and check it out. Jiro points out it is possible to do the whole world since the SRTM mission data is available for the whole Earth. Great job Jiro, this is amazing! Google Earth es probablemente mejor conocido por su enorme colección de imágenes satelitales y fotos aéreas disponibles gratuitamente de todo el mundo. Casi tod el mundo que accede a internet lo ha probado - generalmente pare ver su casa, o encontrar algo sobre un lugar al que quiera ir de vacaciones. La base de datos de imágenes es realmente gigante - millones de kilómetros cuadrados - el equivalente a millones de fotos de 8 megapixeles. Google no dió a conocer los números pero estamos hablando de terabytes de imágenes. Pero de algo que la gente debería tomar nota es de las "Capas" de Google Earth. Las capas están disponibles a través de una interfaz en el rincón inferior izquierdo de la aplicación. Y allí debe haber tanta información como la correspondiente a las imágenes!. Las capas proveén de buena información acerca del planeta en una variedad de temas, y también son una forma que tiene Google de compartir las valiosas contribuciones de información que realizan los particulares y organizaciones. Las "Capas" están organizadas utilizando una estructura del tipo de carpetas y al abrirlas podrán ver en algunas sub-carpetas. Realmente lleva tiempo explorar y aprender todo lo que está disponible. Algo que no deberían hacer es activar demasiadas capas al mismo tiempo. Les recomiendo activar sólo algunas a la vez, y luego desactivarlas para así, poder activar otras y navegar mejor. Cuando vean algún ícono prueben de cliquearlo para ver la información. Algunas de estas capas brindan muchísima información a través de las burbujas de información que se activan al cliquear el ícono de la marca de posición. Terreno - Siempre lo tengo activado. Es el terreno 3D que se vé cuando se inclina la vista, como montañas, valles y cañones. Caminos - Google tiene caminos detallados y calles de muchos países - no todos - que incluyen Canadá, Estados Unidos, muchos de Europa, Brasil, Chile, etc. Más países son agregados cada tanto. Desde mucha altitud no pueden verse los caminos (o verán sólo los principales), cuando esta capa esté activada. Fronteras - esta capa les permite ver las fronteras de los países, así como también su división política interna, costas, nombres, etc. Inclusive incluye detalles de zonas en disputa. Nuevamente, si se acercan verán más información. Sitios Poblados - esta capa es la que muestra los nombres de las ciudades y poblaciones de todo el mundo. Accidentes Geográficos - esta categoría contiene sub-capas con cosas como volcanes, nombres de montañas y lagos. Otra sección de las capas es la que se utiliza para destacar puntos de interés en casos de viajes. Es el mismo tipo de información que se obtiene de un GPS instalado en un moderno automóvil, por ejemplo restaurants, hoteles, etc. Son ejemplos las capas de Viajes y Ocio, Servicio Comunitarios, Alojamiento, Restaurantes, etc. Al igual que los Caminos, Google va agregando continuamente información en estas capas mes a mes. Todas las capas mencionadas arriba son importantes y útiles, pero hay muchas capas muy interesantes que no provienen de Google mismo, o sea no han sido creadas por ellos. Google recientemente lanzó la capa "Web Geográfica" que tiene datos de Wikipedia, Fotos de Panoramio y lo Mejor de la Comunidad Google Earth con una selección de los mejores trabajos publicados por miles de colaboradores de todo el mundo. Y finalmente, GE tiene las capas "Contenidos Patrocinados y Concientización Global" que destacan contenido de una variedad importante de Organizaciones como la Mapas Históricos Rumsey, Revista National Geographic, Discovery Channel, European Space Agency, e inclusive las Naciones Unidas. Esta es destacada información de interés humano, científico, histórico, medioambiental e inclusive, comentarios sobre restaurantes. Si no han explorado las Capas de Google Earth, se están perdiendo un mundo de información. Google está continuamente agregando capas e información a capas existentes. Generalmente se actualizan una vez por mes. Una de las más lindas características de Google Earth es el "Modo Viaje" . Si tienen un camino o una serie de marcas de posición (por ejemplo si han ingresado una serie de direcciones) pueden volar a través de ellas. Por ejemplo, en el panel de "Búsqueda", arriba a la izquierda pueden ingresar un sitio seguido de coma y el país al que pertenece y volar hacia ese lugar, por ejemplo "Buenos Aires, Argentina" y hacer "enter". Ahora verán dos botones "Play Tour" . Presionen el botón Play y recorrerán el tour. Si tienen una serie de marcas de posición en el panel Lugares pueden seleccionar esa carpeta con lugares y utilizar el modo Volar para recorrerlos. Simplemente presionen el botón de Play (abajo en la barra de "Lugares" y recorrerán el tour. Si quieren deterlo, presionen el botón que está a la derecha del Play. También pueden seleccionar la carpeta y presionar ALT-p - para iniciar el viaje. Se puede ajustar la velocidad, el ángulo de visión y la altura llendo al menú "Herramientas->Opciones" ("Preferencias" en la Mac) y elejir la opción "Viajes". Allí podrán ajustar la Inclinación de la cámara, Alcance, y Velocidad . También pueden activar una característica llamada "Mostrar descripción cuando el viaje haga una pausa" que desplegará la burbuja de descripción de cada marca de posición, cada vez que el viaje se detenga en alguna de ellas. 3D Models - GE 4 supports a new format which allows for models which have textures. It also supports the new 3D buildings layer. The official release of GE includes lots of optimizations to improve 3D viewing. Time Animation - the new time slider appears when KML content has been stamped with time. Read about the new time feature. And, here is a list of the top ten time animations done in 2006 for GE 4. New Look - GE 4 has a much cleaner look than GE 3. 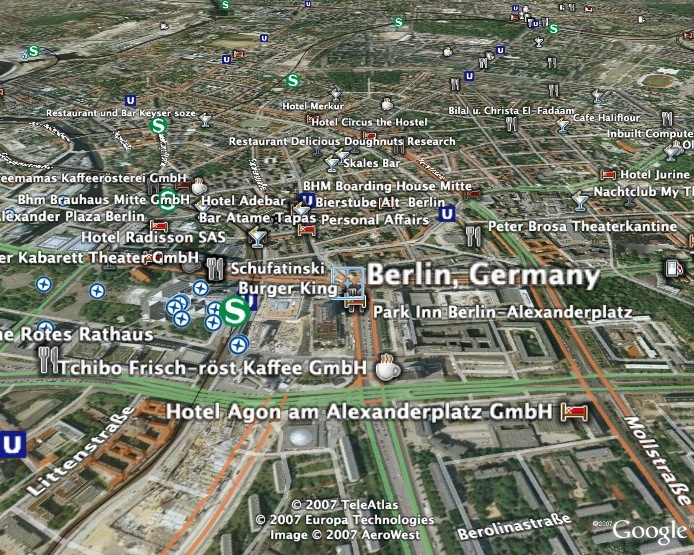 It devotes more attention to the main 3D view, and has a new navigation gadget which appears in the upper right corner. There are too many enhancements to list them all. Some notable ones are: Support for radio buttons in KML, network link icons animate when loading, new organized menus, and more GE Options. Controllers - Support for joystick controllers and flight simulator yokes. And, best of all, the new SpaceNavigator (Windows only at the moment, but a Mac driver soon). Regions - GE 4 supports very large image overlays which can be "tiled" or "regionated" so you can view the full detail as you zoom in. See the "Rumsey Historical Maps" in the "Featured Content" layer for an excellent example of this powerful feature. If you have been following this blog during the past six months, and have been keeping up with the numerous beta releases, you may have seen many of the new features. But, there is so much new content and so many new layers, even I haven't seen everything. Either way, make sure you have the new release and have fun! Thanks to Google and its fantastic Google Earth team for all the hard work! Wondering how I flew through the buildings like that? Check this out to find out how. Google has just released SketchUp 6 Pro - the latest version of their fantastic 3D modeling software. In addition, they have also released Google SketchUp 6 - the free version of SketchUp - which is particularly useful for creating 3D models for Google Earth. 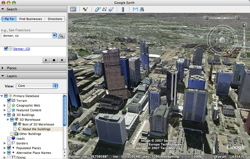 Either program provides an interface for placing 3D models into Google Earth. The new version of SketchUp 6 has a number of nice new features. The most significant from a GE perspective is the new Photo Match tool which makes it even easier to create 3D photo textures. They also have added 3D text capability. This means it will be possible to annotate things in GE with 3D labels. Check out OgleEarth's comments on the new SketchUp and the new features included. 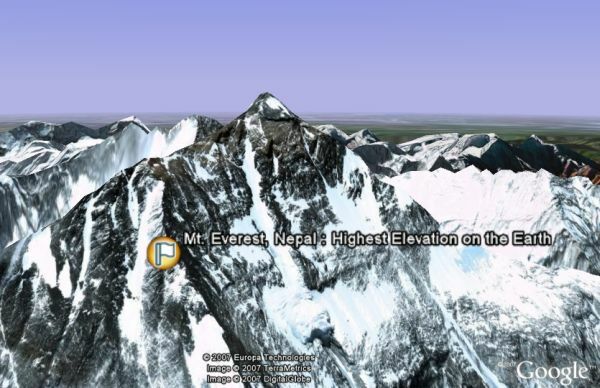 Check out many 3D models in Google Earth right now. If you've already downloaded the latest GE 4 - you can check out the new "Best of 3D Warehouse" 3D buildings layer. Google ha lanzado una nueva capa (visible con GE 4 beta), que te permite ver edificios 3D de alta calidad, muchos de los cuales tienen texturas fotográficas. Les recomiendo descargar la nueva versión oficial de Google Earth 4 porque carga estos modelos mucho más rápido que las versiones beta anteriores ( en realidad la nueva capa no está disponible si no tienen la última versión). Ahora pueden activar la capa "Edificios 3D" y automáticamente se cargarán los edificios 3D de alta calidad disponibles en el área que estén viendo. La capa es un Vínculo de Red que automáticamente carga los edificios pero sólo de ciudades que tengan edificios disponibles. Casi todas las grandes ciudades de todo el mundo tienen, al menos, algunos edificios listos. Arriba hay una imagen de Nueva York. No hay ningún conflicto entre los edificios sin texturas (en gris) y los nuevos de alta calidad. Los grises serán reemplazados cuando estén sus versiones texturadas. Igualmente pueden también descargar el vínculo de red del Depósito 3D para encontrar aún más modelos 3D eligiendo el lugar para ver qué hay allí. Esta nueva capa de edificios es la respuesta de Google al reciente lanzamiento de Microsoft con su producto Virtual Earth 3D beta con varias ciudades con edificios 3D texturados. Microsoft tiene varias ciudades casi completas con este tipo de modelos. Que están muy buenas. Con esta implementación de Google, cualquiera puede hacer y agregar edificios 3D en el Depósito 3D, y pueden ser seleccionados para formar parte permanente de la capa de Edificios 3D. Vamos a ver cómo evoluciona esta capa con el correr del tiempo. Lean acerca de otras nueva capas agregadas hoy también. Yelp Reviews - A new Featured Content layer of reviews from the web site Yelp.com which hosts reviews by people who have been there. 3D Buildings - Google has decided to make the large repository of quality 3D buildings from the 3D Warehouse easier to view. If you have the latest GE 4 beta, you can now turn on a "Best of 3D Warehouse" layer under "3D Buildings" and it will automatically load high quality buildings for the area you are viewing (using a network link). You can also still download the 3D Warehouse network link to find even more 3D models and select the placemark to load them up. See this for more details. Roads of Brazil - Remember a few days ago when I said some of the new roads for Google Maps were not in GE? Well, they at least added the new ones for Brazil. But, where is Australia, New Zealand, etc? In fact, the crude base layers of roads for those two countries are gone now. Maybe that's a sign the new road layers are coming. Geographic Web - there seems to be a lot more Panoramio photos in the "Geographic Web" layer. "Sunrise Earth" - Under the "Featured Content" layer you will find "Discovery Network", there is now a new sublayer called "Sunrise Earth". 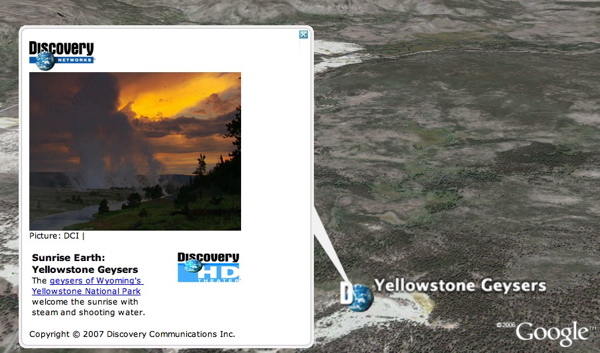 This shows placemarks for locations where Discovery HD has "Sunrise Earth" programs and if you click on the placemarks the picture is a link to 2.5 minute video clips from the programs. 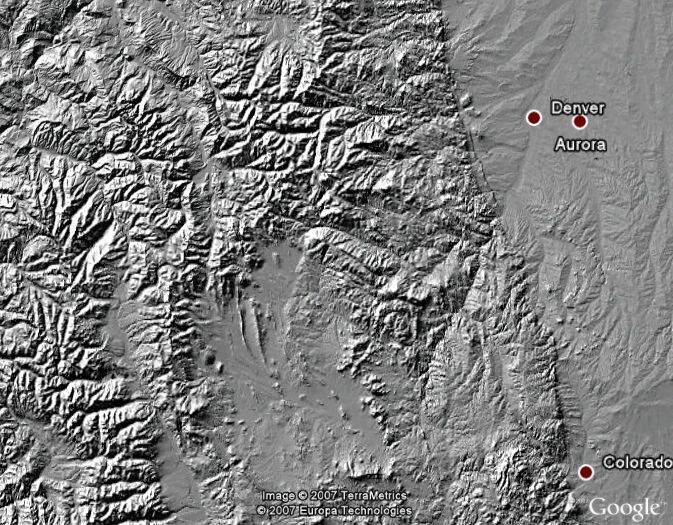 El Mapa General es una característica en Google Earth para ayudarte a determinar tu posición sobre la Tierra. Lo puedes activar o desactivar llendo al menú "Ver" y elegir "Vista General del Mapa". El Mapa de Vista General te ayuda a tener una perspectiva del lugar de la Tierra que estás observando, y es una forma rápida de ir a otra parte del mundo que quieras ver. Lo puedes activar o desactivar con una combinación de teclas: Control-M. Puedes también ajustar el tamaño del mapa llendo a las Opciones (en "Herramientas->Opciones" en la pestaña Vista 3D ó en "Preferencias" en la Mac). Aquí se puede cambiar también la "Relación de Acercamiento" que significa qué tan preciso es la vista del Mapa General con respecto al nivel de acercamiento de tu vista 3D (por defecto, infinito). Vean este video impresionante que muestra un tipo lanzando un pequeño VANT (Vehículo Aéreo No Tripulado) a control remoto con una cámara digital, que utiliza para capturar imágenes y mostrarlas en GE. La Compañía Pict'Earth, ha lanzado este video en su sitio web. El operador puede ver las imágenes en tiempo real a través de unos anteojos de realidad virtual. Luego, las imágenes pueden ser vistas en GE. Esto debe ser la cosa más impresionante que ví hacer con GE! Y hay algunos usos prácticos para esta tecnología. Google debería tomar nota. Esta tecnología podría ser muchísimo más barata que comprar imágenes satelitales de alta resolución. Aunque sea para imágenes de eventos especiales. Speigel and Hanke - Spiegel Online interviews John Hanke, who led the company Keyhole which developed the application which became Google Earth. 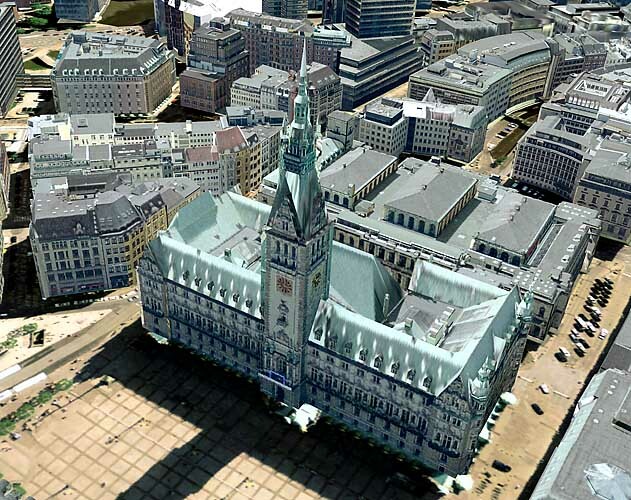 A couple of interesting quotes: "A new version of Google Earth will soon hit the market that allows users to admire a whole gamut of cities in largely photorealistic detail. New York is one of them." and also: "...points out that administrative authorities in Gran Canaria -- one of the Canary Islands in Spain -- have already provided three-dimensional images of all their towns." Looks like more 3D buildings are coming. New FAQ - John Gardiner has posted a new FAQ to help answer questions about the new Geographic Web layer. It helps answer questions for those interested in seeing Wikipedia information included in the new Wikipedia sub-layer. Licensing Issue - An article written in the Guardian talks about the reason why the Virtual London 3D models (see sample movie) developed by the folks at CASA (who write the Digital Urban blog I frequently blog about) have not been made available to the public for viewing in Google Earth. Apparently the reason has to do with a licensing issue between Ordinance Survey (OS) in England and Google. The OS seems to have a real lock on mapping data in the UK. Read OgleEarth's comments. Military Strategy - The Strategy Page makes some interesting observations about how the availability of satellite photos in Google Earth has been changing the perception of the importance and desire of troops to get their hands on military-grade satellite imagery. I'm not sure how accurate the information in the article is with regards to whether the troops have the right tools available. It certainly seems that the appropriately cleared personnel should be able to get the imagery they need in an application as easy to use as GE. In fact, I'm sure Google has talked to the military about using GE for just that purpose (for use with the military's databases). But, who knows whether the military would use GE, or spend millions of dollars developing something harder to use. For some reason, the Google Earth Road layers haven't been staying synchronized with Google Maps. The only exception in the last few months I'm aware of is when Japan was added to both in September. During the last few months, Google Maps has added detailed road maps for Australia, New Zealand, South Africa, Singapore, Hong Kong, and Brasil. None of these locations are available with detailed road maps in Google Earth. I guess the process to convert road layer information into the vector format needed for GE is requiring more work. Either that or there are some sort of licensing issues. But, Google isn't saying what the issue is - I've asked. At least residents in these locations can turn to Google Maps - however, on another rant: Google Maps still doesn't provide a button to view the current location in Google Earth! Why is that? Over the holidays, 'jpwade' (who has contributed many 3D models to the GE Community) posted a 3D model similar to the Black Pearl ship from the movie "Pirates of the Caribbean". 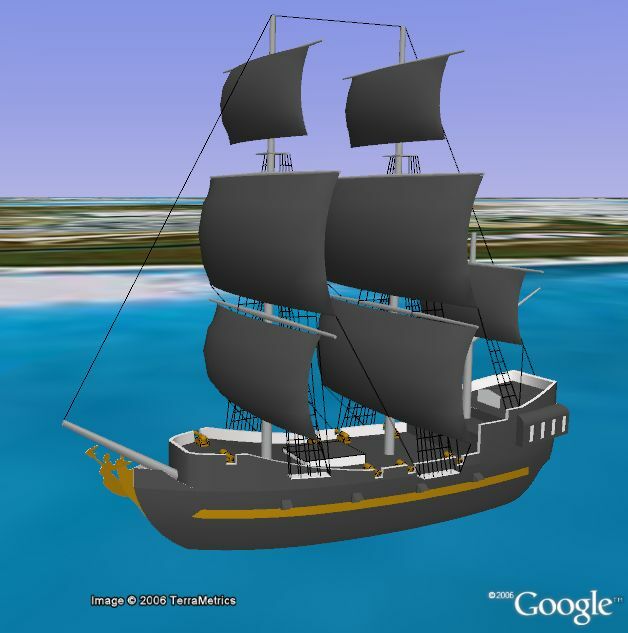 He also implemented a time animation showing the ship sailing about in a bay in the islands. 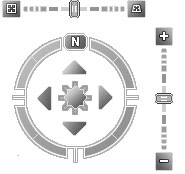 Load the Black Pearl model (you must be using GE 4) and hit the "Play" button (a right arrow triangular button on the right of the time slider in the upper part of the screen). Pay close attention to how it animates at the beginning. It seems his version of the Black Pearl has capabilities similar to the Flying Dutchman. Thanks Joey! 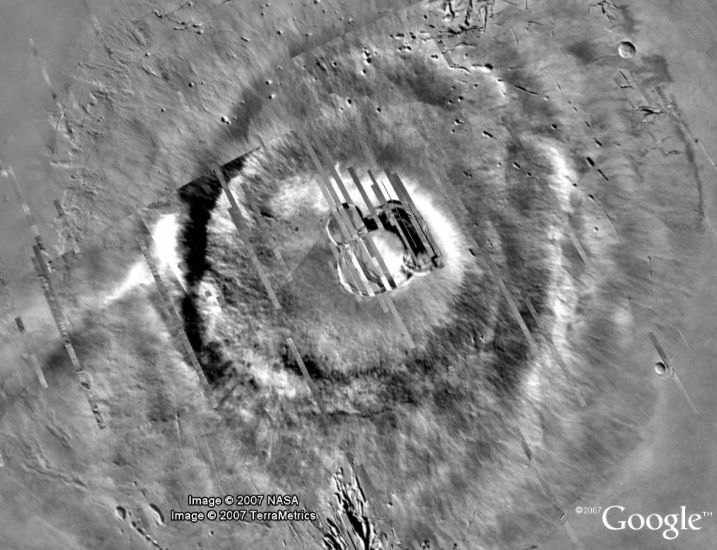 Si eres nuevo en Google Earth (GE), o estás buscando maneras de mejorar cómo interactuar con él, este artículo puede ser una ayuda. Otras fuentes de referencias las encontrarás debajo. Nota: este artículo asume que estás utilizando GE versión 4 - vean esto para consejos sobre GE versión 3. Aprender a manipular el mouse y las teclas es crucial en GE para tener las mejores posibilidades de vistas de la Tierra. La primer cosa importante que debes saber es cómo acercarse para ver mejor la superficie terrestre. Tienes varias formas de hacer esto: haz doble clic con tu botón izquierdo del mouse para acercarte y, si tienes un mouse de múltiples botones, doble clic con el derecho para alejarte; usa también la ruedita del medio (si tienes una) o usa las combinaciones CTRL-FLECHA ARRIBA o CTRL-FLECHA ABAJO . Puedes también utilizar los botones "+" y "-" de las barras de navegación desplazables de arriba a la derecha para cambiar la altitud. La rueda de scroll del mouse es probablemente el método favorito de los fanáticos de GE. Todos estos métodos ajustan la altura sobre la superficie terrestre. Puedes ver la altura sobre el nivel del mar (del punto desde el que estás mirando) en el rincón derecho y abajo de la pantalla. Puedes moverte hacia un punto de la superficie que quieras ver haciendo 1 clic con el botón izquierdo sobre la superficie de la tierra y arrastrar el mouse para ubicar ese punto más o menos en el centro de la pantalla, luego suelta el botón del mouse. Hagan clic en éste vínculo para ir a GE y volar al Monte Santa Helena. Hermoso, verdad? Bueno, prueben esto: presionen la tecla PgDown (ó AvPag en algunos teclados en español) y vean cómo se inclina el punto de vista para poder apreciar el Monte Santa Helena en 3D (si no lo ven en 3D, asegúrense de que la capa "Terreno" esté activada). Está bueno, no? PgUp (ó RePag en teclados en español) inclinará la vista nuevamente hacia arriba. También pueden usar el control deslizable de arriba a la derecha para inclinar. Un lindo consejo: presionen la tecla "u" para inclinar hacia la vertical automáticamente. La tecla "r" resetea la visión a la posición vertical con el Norte alineado hacia arriba. Una manera más fácil de inclinar y desplazar la vista es hacer clic con la ruedita central y arrastrar, luego soltar (aquellos de Ustedes que usan Mac con un mouse de 1 sólo botón deberán usar las técnicas explicadas arriba, pero les recomiendo que se consigan un mouse de 3 botones). Mientras presionan la ruedita central de scroll del mouse, y mueven el cursor hacia adelante o atrás, la vista se inclina o se pone más vertical. Arrastrando de esta forma pero de lado a lado verán cómo recorren alrededor del punto observado. Si mientras hacen esto presionan la tecla SHIFT la rotación mantiene la altura de observación mientras se rota. Usando Google Earth - Blog en inglés de un especialista de documentación de Google Earth. SpaceNavigator - Un mouse 3D avanzado para GE. Over the next few days, I will be re-writing and publishing some of the Google Earth tips I've written since this blog began that were based on GE 3. The changes will reflect differences based on the newer GE 4. Eventually, when GE 4 is no longer beta, I will change the GE Basics page to reflect only GE 4 tips (although the old page and stories will still be available for those who are unable to upgrade from GE 3 for whatever reason). Even some of you regular GEB readers may find some useful tips. Oh, and feel free to add comments with other useful tips! The next blog entry is the first upgraded tip entry. Google's recent GE 4 Beta release (on December 16) included a new feature for GE Plus/Pro/EC users. If you have a compatible GPS (current Garmin units work well) you can show your position in the new GE by simply turning on a new option under the "Tools->GPS->Real-time" option. 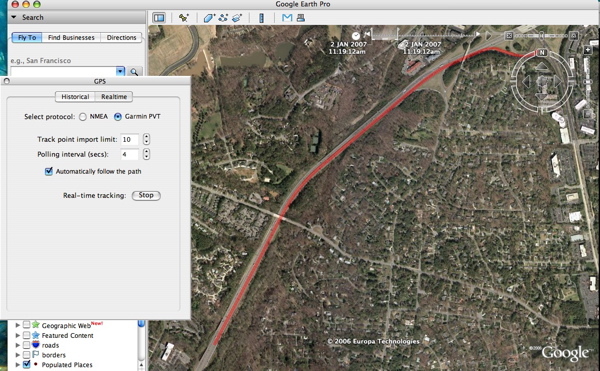 For my Garmin, I used the "Garmin PVT" option with the GPS (a Garmin 60Csx) hooked up through USB to my Intel MacBook. This works on both the Windows XP and Mac OSX version of GE Pro in my tests. If you turn on the "Automatically follow path" option, GE will zoom to your current position and will automatically zoom to a level showing the path of the points most recently imported from your GPS (you can specify how many points - up to 100). I wish there was a way to set the altitude and tilt for your view while following, but the view works pretty well now. 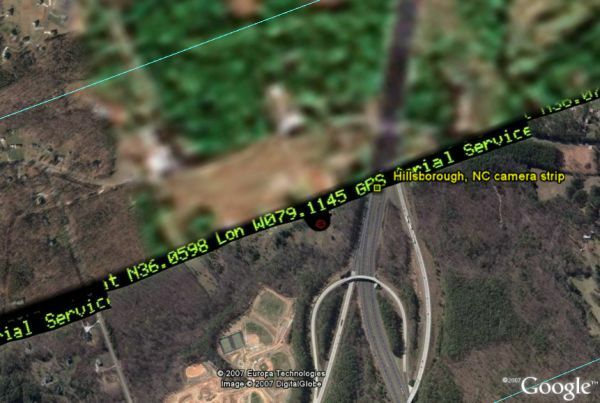 Here is a sample of a GPS track I saved after stopping at an exit off the highway. You can of course upload your entire track from your GPS and use a tool like GPSVisualizer.com to do fancier track visualizations. If you are using this in your car (or other forms of transportation) you probably will not have Internet access. So, it is important to first load your GE cache up with imagery/data for the area you will be traveling before you leave your Internet connection behind. For example, I set up driving directions for the trip I planned and played the tour of my drive before I left the house. You need to make sure the playback of the tour is slow enough to allow each area of imagery to load into cache (check the GE options for "Touring->Tour Speed"). By the way, if you are using the free version of GE, there is a free application available called GooPs which let's you do real-time GPS tracking. It has been posted and updated by GEC member 'davidhite'. I haven't tested it myself yet, but I plan to since I see he recently supports an air-based feature (i.e. tracks with altitude). So, I will try this on a flight sometime soon. For many other articles on GPS and Google Earth read the GPS category. Happy 2007 everyone! I've just reviewed the 2006 year-end statistics for Google Earth Blog (GEB), and it was an amazing year. GEB had 7,977,793 page loads on the web site (this does not include RSS readers which amounted to over 3 million requests in 2006). There were also 3,744,498 unique visitors to the web site. I'm happy to report that my readership is very international with approximately 60% of traffic from non-US locations. Special thanks to Google Adsense for helping make it possible for me to dedicate the time to write this blog. Also, thanks to the many sponsors through Google Adsense, Amazon, and a few direct sponsors on GEB. The biggest thanks to the Google Earth team for a great program and to the MANY GEB readers! Superoverlay - Valery Hrosunov has released Superoverlay Pro ($95) which includes scheduling of tasks to process Superoverlays. "Superoverlay is a stand-alone Google Earth application for tiling raster datasets and creating view based regions in KML or KMZ files. Also Superoverlay can generate world files for all images in ArcView style". In other words, it helps you put large image overlays into Google Earth (for example alternative maps or aerial photography). GE Chess - Another game to be played with Google Earth. This one lets you set up a 3D Chess board in Google Earth. You have to do a free registration to get started (no e-mail required), and you have to install 3D models on your local drive before you can start. Instructions are provided. Check out the GE Chess game by Ashley Joyce. Geosite - This product was recently released by CH2M Hill, a global engineering construction and operations firm. GISCafe Weekly has a summary of the new product which allows customers to dynamically view project information within Google Earth. ArcGIS Explorer - the virtual globe browser from GIS software giant ESRI was finally released in beta form a few weeks ago. Stefan Geens of OgleEarth has done a thorough review of the product from a Google Earth perspective. His final conclusion is that AGX so far is a disappointment.